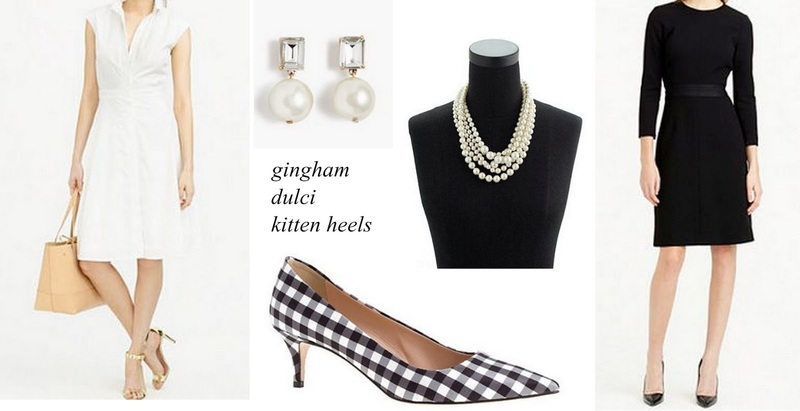 I love J. Crew’s Dulci heels. They were first released in fall 2014. I waited for the ones I liked to go on sale, but most sold at full price. Some sold on on a full price promo. I’m a believer and was able to score a unicorn of a popback in the suede glitter stripe dulcis. I’m also not a quitter and like a special agent hunting a fugitive, I also got a hold of the leopard dulcis (review). Earlier in the week, J. Crew released gingham dulcis ($228). They seem very fall, but I can see them with a white dress like the one in this set. You can get the gingham dulcis for 30% off with SHOPNOW thru tonite, 6/5. A few years ago, I wasn’t in the kitten heel fan club. The heel felt to low and I didn’t like the inward swoop that most of them had. The heel on the dulci is more on the straight side, with no exaggeration. I can wear a midheel comfortably and push a stroller, but there’s no doubt that a lower heel makes it easier. Even if I’m sans stroller, I sometimes need to travel faster. I think I just talked myself into ordering these. I love these heels, so lady like! I still can't justify spending that kind of $$ on shoes even if they are full price with discount. I just feel bad since I have way too much shoes already. They will look great on you! ooooo…………..I love them, Gigi. I am a bona fide shoe collector and those would look good so many things! I've been eyeing the yellow/greenish sequin Dulcis, but they'll no doubt sell out before I get my feet in them! I don't have any Dulcis, but I'd like to! Good shoes are going to cost money. And if they are comfortable they are worth it! Are the Dulci's more comfy than the Valentinas? My feet didn't like those for anything other than going out to dinner………LOL. Hi Vava – I always think the yellow & neon green pieces end up going on sale at J. Crew it's a tough color to pull off. Easier on the feed, though. This shoe is different than the Valentina, which is a D'orsay. I had to break mine in before they fit comfortably. It took a few tries. No breaking in nesc w/the dulcis. I love the shape of the Dulci. The gingham is so cute, though I feel like I won't want to wear it next spring. I really wish they would make the Dulci in some regular leather solid colors, like black, grey, red. I would buy those in a heartbeat. Desert Flower – I can see the ginghams living like plaid and stripes in my life. A classic. However, I'm not as much a gingham person as I am stripes, so there's that fact. Leather Dulcis would be a dream. I have read several excellent stuff here. Definitely price bookmarking for revisiting. I wonder how a lot attempt you set to create this sort of fantastic informative website. Thank you for another fantastic article. Where else could anybody get that type of information in such a perfect way of writing? I have a presentation next week, and I am on the look for such information. I’ve been browsing online greater than three hours these days, but I by no means found any attention-grabbing article like yours. It is beautiful price enough for me. In my opinion, if all site owners and bloggers made good content material as you did, the web might be much more helpful than ever before. I simply want to mention I am just all new to blogging and absolutely enjoyed this web-site. Almost certainly I’m likely to bookmark your blog post . You absolutely come with excellent well written articles. Thanks a lot for revealing your blog. I simply want to mention I am just very new to weblog and truly loved this web site. Almost certainly I’m likely to bookmark your website . You absolutely come with wonderful writings. With thanks for revealing your blog. I simply want to tell you that I am just very new to blogs and seriously loved this blog site. Most likely I’m going to bookmark your blog . You definitely come with exceptional stories. Thanks a lot for sharing with us your blog site. I just want to tell you that I am just newbie to blogs and certainly savored your web page. Most likely I’m likely to bookmark your site . You certainly come with great stories. Thanks a lot for revealing your web-site. I just want to tell you that I am newbie to blogs and definitely loved you’re web site. Very likely I’m planning to bookmark your website . You surely come with wonderful articles and reviews. Kudos for revealing your blog. I simply want to tell you that I’m very new to blogging and site-building and actually enjoyed your web page. Most likely I’m likely to bookmark your site . You absolutely have superb article content. Thank you for sharing with us your website. I just want to mention I’m beginner to weblog and actually enjoyed your blog site. Probably I’m want to bookmark your blog post . You actually have superb articles and reviews. Cheers for revealing your web site. I simply want to tell you that I am new to weblog and certainly liked this web site. Probably I’m likely to bookmark your website . You definitely come with tremendous writings. Thanks for sharing your web page. I simply want to mention I am beginner to weblog and really enjoyed this blog site. Very likely I’m likely to bookmark your site . You definitely have beneficial well written articles. Kudos for sharing with us your web site. Thanks for another informative website. The place else may I am getting that kind of info written in such a perfect approach? I have a undertaking that I’m simply now running on, and I’ve been on the look out for such information. I precisely desired to thank you very much once more. I do not know the things I might have achieved without the actual opinions provided by you relating to that situation. It truly was a real hard setting in my opinion, nevertheless being able to view a well-written fashion you handled the issue forced me to weep with joy. I will be grateful for your information as well as have high hopes you are aware of an amazing job you are carrying out training others thru your blog. I’m certain you haven’t come across all of us. I just want to mention I’m new to blogs and seriously savored this web-site. More than likely I’m want to bookmark your site . You amazingly have perfect writings. Thanks a bunch for sharing with us your web-site. hi!,I love your writing so a lot! percentage we keep in touch extra approximately your article on AOL? I need an expert in this space to resolve my problem. Maybe that is you! Taking a look forward to see you. I just want to mention I’m all new to blogging and site-building and truly loved your web blog. More than likely I’m planning to bookmark your site . You surely come with remarkable well written articles. Thanks for sharing with us your website. I am glad for commenting to make you know of the outstanding encounter my daughter encountered browsing the blog. She even learned such a lot of details, including how it is like to have an excellent teaching nature to have other folks really easily fully grasp specific complicated subject matter. You really did more than readers’ expected results. Thanks for supplying these warm and helpful, trusted, informative and as well as cool thoughts on this topic to Evelyn. Generally I don’t learn article on blogs, however I would like to say that this write-up very compelled me to try and do so! Your writing style has been amazed me. Thanks, quite nice article. Needed to send you that bit of observation in order to say thank you again for those superb tricks you’ve documented on this page. It is simply remarkably generous with people like you in giving without restraint precisely what a number of us could possibly have supplied as an electronic book in making some bucks for their own end, most notably considering that you might have done it if you decided. Those principles also worked as the great way to recognize that other people have the identical dreams similar to my very own to learn significantly more in terms of this problem. I think there are a lot more fun opportunities up front for many who go through your site. I definitely wanted to write down a quick comment to thank you for all the precious recommendations you are posting at this site. My prolonged internet search has at the end been recognized with sensible knowledge to share with my family. I ‘d point out that we site visitors actually are really fortunate to live in a superb place with so many awesome professionals with useful ideas. I feel really happy to have come across your site and look forward to plenty of more cool times reading here. Thank you again for a lot of things. whoah this blog is great i love reading your articles. Keep up the great work! You know, a lot of people are hunting around for this information, you could help them greatly. Howdy! I could have sworn I’ve been to this blog before but after going through many of the articles I realized it’s new to me. Anyhow, I’m definitely happy I discovered it and I’ll be bookmarking it and checking back regularly! I do accept as true with all the ideas you have presented to your post. They are really convincing and can certainly work. Still, the posts are too brief for beginners. May you please extend them a bit from subsequent time? Thanks for the post. I’ve been browsing on-line more than 3 hours these days, yet I by no means discovered any interesting article like yours. It is beautiful value enough for me. In my opinion, if all site owners and bloggers made just right content material as you did, the net shall be a lot more helpful than ever before. I am not sure the place you’re getting your information, however good topic. I must spend a while learning much more or understanding more. Thanks for fantastic info I used to be on the lookout for this information for my mission. Aw, this was an exceptionally good post. Taking the time and actual effort to generate a very good article… but what can I say… I procrastinate a lot and never manage to get anything done. I enjoy reading a post that can make men and women think. Also, thank you for allowing for me to comment! hi!,I really like your writing so a lot! share we communicate more about your article on AOL? I require an expert in this house to solve my problem. Maybe that is you! Having a look ahead to look you.